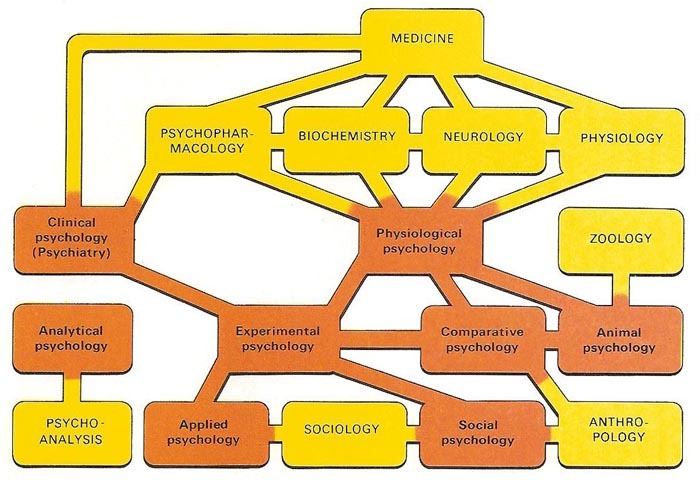 The different branches of psychology (red) and their links with allied sciences (yellow). Originally the branch of philosophy dealing with the mind, psychology became the science of mind, and is now considered in its more general context, to be the science of behavior, whether human or animal. It is intimately related with anthropology. (See also animal behavior.) Clearly, psychology is closely connected with, on one side, medicine and, on the other side, sociology. There are a number of closely related human branches of psychology. Experimental psychology embraces all psychological investigations controlled by psychologists. Their investigations may center on the individual or group, in which case statistics will play a large part in the research. In particular, in clinical psychology, information is gained through the treatment of those suffering from mental illness. Social psychologists use statistical and other methods to investigate the effect of the group on the behavior of the individual. In applied psychology, the discoveries and theories of psychology are put to practical use. Comparative psychology deals with the different behavioral organizations of animals (including humans).